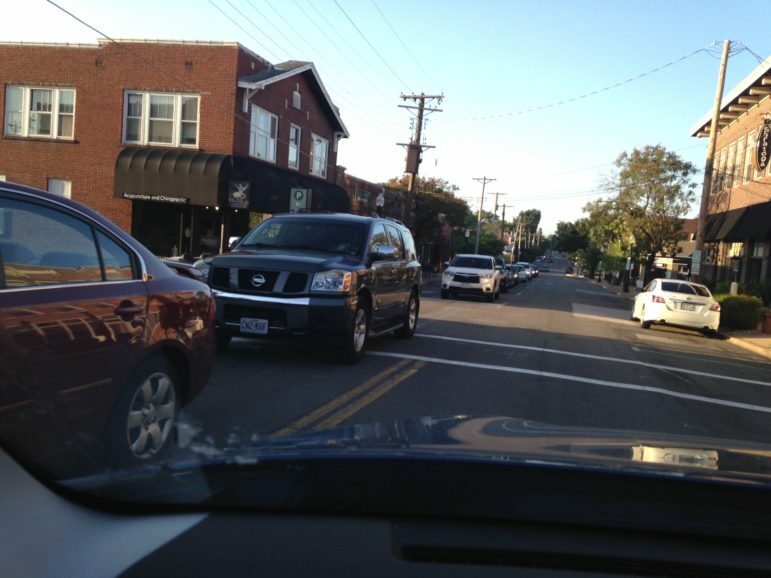 A woman in an SUV hit a motorcyclist at S. Big Bend and Manchester Road at around 7:30 a.m. Wednesday, KMOV reported. Officials told KMOV the motorcycle driver was taken to the hospital, and a woman and child who were inside the SUV were not injured. Update: As of Wednesday evening, the motorcyclist was in the hospital and in stable condition, Maplewood Police report. The traffic caused a backup on eastbound Manchester, and northbound Sutton as drivers tried to avoid the traffic. 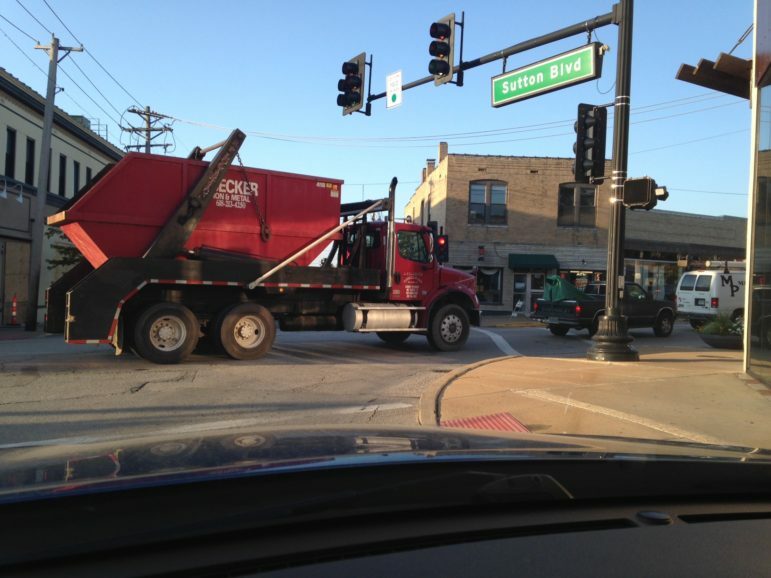 This truck blocked Sutton Boulevard at Manchester Road for a cycle of the traffic signals. Traffic was backed up south on Sutton Boulevard for blocks. I wonder if the construction situation was a factor in this. I avoid this intersection like the plague since the project began. I saw him motionless on the floor. Must be less than 21 years old. Was so relieved to see him move his legs. So glad he is in stable condition. I haven’t seen anything in the news other than your reporting, Doug. Do you know the injured motorcyclist’s condition? I’m hoping he or she is all right. 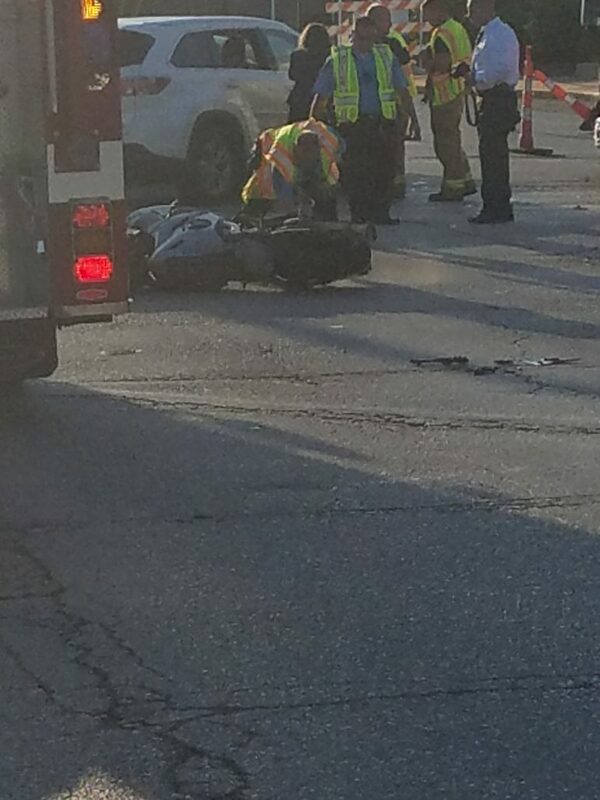 I saw the mangled motorcycle this morning, in the intersection. It was terrible to see.